Our Public Information Center offers some 500 films, providing a complete introduction to every aspect of Dianetics and Scientology—including the beliefs and practices of the religion as well as a biographical presentation on the life and legacy of our Founder, L. Ron Hubbard. Our Information Center further includes exhibits on the many humanitarian initiatives and community outreach programs our Church sponsors. Visitors are welcome to tour the displays at their leisure for as long as they wish and to return as often as they like. Our Café welcomes those touring the Church or attending our many scheduled events. It is further provided for the convenience of parishioners on break from their Scientology services. The adjoining veranda provides expansive views of the grounds and Las Colinas beyond. The adjoining veranda provides expansive views of the grounds and Las Colinas beyond. The bookstore makes available Founder L. Ron Hubbard’s works on Dianetics and Scientology. In all, Mr. Hubbard’s legacy comprises tens of millions of published words in dozens of books and thousands of recorded lectures. These materials are also available in 15 translated languages. Our Church provides for the delivery of all Introductory Services. These include courses for the study of L. Ron Hubbard’s Dianetics and Scientology books and lectures, as well as an array of Life Improvement Courses that empower one with the tools to improve any aspect of life. Among the many further services available are evening and weekend Dianetics and Scientology seminars imparting an overview of fundamental principles and their application in life. L. Ron Hubbard developed the Purification Program to free individuals from the mental and spiritual damage caused by drugs and toxins, through a regimen of exercise, sauna and nutrition—all of which are provided for in our Purification Center. The mural pays tribute to the thriving Dallas-Fort Worth metroplex that stands as the embodiment of the motto, Live Large and Think Big. 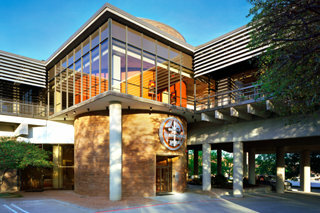 The Academy is where Scientologists train to become auditors (spiritual counselors), capable of applying the technology of auditing to help others attain spiritual freedom. Our Dallas Academy comprises multiple course rooms, each devoted to a different aspect of training. 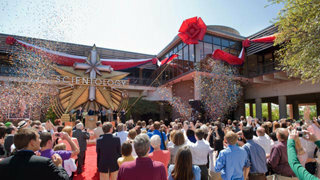 It is with great pride we welcome you to the Church of Scientology Dallas. To that end, we look forward to working together with every group and individual dedicated to our common goals of a drug-free, crime-free and thriving future—a future where all can achieve their dreams in the true Texas spirit of living large and thinking big.